20 ausgewählte Studio- und Live-Konzertaufnahmen von 1974-1990. Neben den schönen älteren Kompositionen sind interessant: "Wings of Silence" aus: Videosoundtrack: "The Petrified Forest" (1989) und die 27 Min. lange Live-Synthesizer- und Flötenimprovisation "In the Woods". For over four decades, Deuter has offered listeners a gateway to a new musical experienceone that incorporates lightness of spirit, depth of vision, and an innovative blend of acoustic and electronic sounds. Deuter was instrumental in bringing the music of India and the Far East to Western audiences long before the music industry became familiar with the concept of world music. Despite the fact that he has introduced new dimensions and a fresh approach to music from other cultures, Deuter's music has always remained accessible to his listeners. 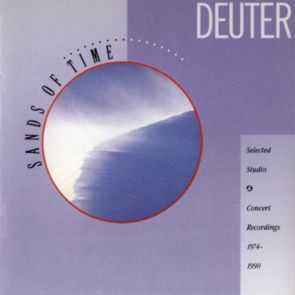 Sands of Time is comprised of selected studio and concert recordings from Deuter's long and distinguished career. The first recording features compositions from such seminal albums as Silence is the Answer (12049-2), Nirvana Road (11068-2), Celebration (11040-2), Cicada (11056-2), Land of Enchantment (11081-2), and San (11084-2), as well as music from the video soundtrack to The Petrified Forest (19001). The second recording offers six digital selections from concert performances throughout the United States. Throughout the recordings, Deuter's gentle melodies and joyful rhythms are embracing, like an invitation to dance and celebrate life itself. Sands of Time speaks directly from the heart of the player to the heart of the listener. Deuter is an accomplished musician who plays many instruments, including flutes, recorders, guitar, sitar, synthesizers, and percussion, and incorporates voice harmonics into his music. Born in Falkenhagen, Germany, in 1945, Deuter first learned to play the flute and guitar. Following high school, he moved to Munich, and worked as a graphic designer and newspaper columnist. During the 60s, Deuter began to question conventional values. Searching for answers, he joined the Sufis, studied with a follower of Gurdjieff, and began refocusing on music. Deuter's love of nature has always had a strong influence on his style, and he frequently blends natural sounds with his music. In 1970, the trauma of a nearly fatal auto accident sparked a dramatic and irrevocable transformation; music and a personal spiritual search became Deuter's lifeblood. Deuter's first recording, D (11009-2) , was released in 1971 on Kuckuck. Extended travels throughout India and the Middle East infused subsequent recordings with a unique cross-cultural musical perspective. Deuter composes and records from his current home in Santa Fe, New Mexico. His long association with Kuckuck has produced thirteen recordings and a video, The Petrified Forest (19001), on the affiliated MonteVideo label. 1 Gratitude from Silence is the Answer (12049-2) 5'18"
2 Connemara from Nirvana Road (11068-2) 5'51"
3 Life is Love from Celebration (11040-2) 7'07"
4 Wings of Silence from The Petrified Forest (19001-2) 5'28"
5 Alchemy from Cicada (11056-2) 7'28"
6 Silver Air 3 from Land of Enchantment (11081-2) 2'30"
7 Silence is the Answer (Part 1) from Silence is the Answer ((12049-2) 5'46"
8 Meadows and Mystics from Nirvana Road (11068-2) 3'17"
9 Le Ciel Est Bleu from Celebration (11040-2) 3'23"
10 Song of the Heart from Silence is the Answer ((12049-2) 2'08"
11 Echo of the East from Nirvana Road (11068-2) 3'30"
12 Cagnes Sur Mer from San (11084-2) 7'29"
13 Waves and Dolphins from Land of Enchantment (11081-2) 4'21"
14 Celestial Harmony from Land of Enchantment (11081-2) 6'22"
1 In the Woods 27'01"
5 Voice of the Night 10'39"